This entry was posted in Anime, Random and tagged anime, arakawa under the bridge. Bookmark the permalink. Sister and Maria, such adorable interactions. Lol, it’s got weird written all over it but it seems like it’ll be interesting. I’m hoping they’ll be able to deliver the comedy well. Well, atleast we already have an idea of what it could be like (pointing at ed song). Hah, true. But I hope the costumes look more sleek and stylish. 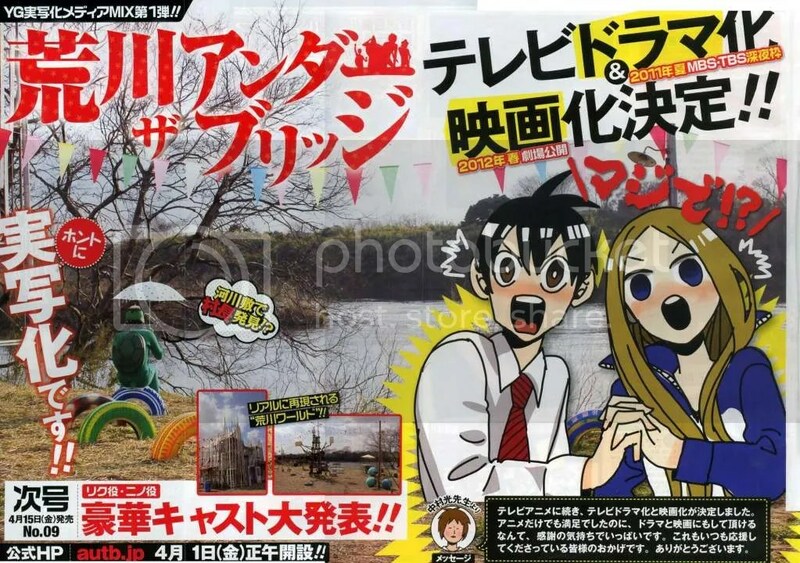 Not sure what to think about this, on one side I can see something like Arakawa Under the Bridge working well as a live-action show (the previews and Hoshi/Star’s music video). But on the other it won’t have Maaya Sakamoto, Hiroshi Kamiya, Takehito Koyasu, Miyuki Sawashiro, and probably Tomokazu Sugita in it. Or any of the voice cast for that matter, despite that it could still be fun though. I hope the actor’s voices would be able to match with the character’s appearances.